This is the place to find out what's going on in the neighborhood (as reported from legitimate sources) and other items of interest as it pertains to living in Harvest Lane or The Ridge at Harvest Lane. It's maintained by me (Anthony) and it's simply a resource for all of us. Enjoy! We hope everyone had a great time the past few years and we look forward to seeing you again on July 4th, 2013. Be sure to decorate the kid's bikes, trikes, scooters, strollers & dogs and plan to meet at 12057 West 75th Lane by 9:00 a.m. After everyone is done traveling the Harvest Lane Parade Route, we invite you to stick around for coffee, doughnuts, popsicles, bottled water while visiting with the Arvada Fire Dept and your neighbors! Any questions - please call me at (303) 520-3179. >> Clean Up Your Dog Poop - It's the Law! >> Harvest Lane "Neighborhood Watch" Program? Are you interested in participating in a "Neighborhood Watch" Program in cooperation with the Arvada Police Department? If so, please click here to read about the program - then call Anthony at (303) 520-3179 to see if we have enough volunteers. >> 9News Story - "Rash of Home Burglaries Concern Arvada Police". The news segment was filmed at the corner of 72nd & Simms. Here's a link to the video. Fellow Harvest Lane Neighbors, we have had confirmed reports of two burglaries in Harvest Lane this month. The burglars went through unlocked back & side yard garage doors of the homes and stole a purse from one resident and a wallet from another two houses down. There have also been rumors of two additional incidents on The Ridge although I have not been able to confirm this with the Arvada police department's crime reports website. Police are asking residents to please be proactive and stop encouraging these criminals by leaving your garage doors open and/or leaving side entry doors unlocked – even when you are home. Special thanks to Gretchen Pate and others for sharing these alerts. >> Wow, how time just flies when we're having fun! The real estate market in the Denver area is so hot right now I haven't had time to update this website with neighborhood stats. I will have some updated info posted by July 1st. You can now reach this website via the new domain name - HarvestLaneNews.com. Remember, this is a community website, so if you would like to share something with your fellow neighbors, call Anthony Rael at 303-520-3179. Subscribe to the HarvestLaneNews e-newsletter and keep up to date with what's happening in our community. >> How Much Is Your Home Worth? Not sure if the time is right to sell your house or you just want to know much much it's worth in today's market? Call me (Anthony Rael) for a complimentary market analysis today! There's no obligation. >> Should You Spend Money On That? Anthony can estimate what your return on investment (ROI) would be for a specific improvement before you spend the money. I use a proprietary database that shows the cost versus value of specific big-ticket home improvements so you don't make a mistake and spend money on something that won't result in a good return on your investment. This is a complimentary (free) service! Contact Anthony Rael at (303) 520-3179. The number of properties available for sale in Arvada continues to be very low at approximately -30% below January 2012. Buyer demand is very high right now because there are simply not enough quality homes to choose from. The local and national economy is improving and buyers want to get locked in 30-year mortgage interest rates which continue to hover in the 3.25% to 3.75% range! >> Spring Cleaning - Community Garage Sale! I know it's a little early to start thinking about this, but I would like to organize a great community garage sale weekend in April or May. if you have any suggestions, call Anthony at 303-520-3179. Hope you had a happy holiday season and wishing all of my Harvest Lane neighbors the very best in 2013! The current real estate market continues to struggle at the $400,000 - $500,000 price point. We had two sales on The Ridge at $460,000 & $460,000 this summer and this was mostly due to the two lower-prices sales from late 2011 that appraisers used against them. We had three sales in Harvest Lane (down the hill - closer to Simms) ranging from $300,000 to $350,000 (two were short sales). We're currently experiencing a shortage of quality homes in Arvada. If you are thinking of selling, don't wait until next spring - the opportunity is now while while inventory is low and 30-year interest rates are hovering around 3.5%! If you have any questions, please contact Anthony Rael at (303) 520-3179. You can now reach this website via the new domain name - HarvestLaneNews.com. Remember, this is a community website, so if you would like to share something with your fellow neighbors, please drop me a note. >> Flower Box Update - Volunteers Needed! Thanks again to Harvest Lane neighbor Sue Norman & her father-in-law for planting flowers and a few small perennials at the bottom of the hill (75th & Taft) for the past several years. Due to health reasons, they will not be able to do it this year, so we're hoping that YOU will volunteer to help with planting & watering throughout the summer. For more info, please contact Anthony Rael at (303) 520-3179. Thank you! Inventory throughout the Denver area is running -36% below January 2011. There's simply are not enough quality homes for sale so buyers are somewhat frustrated - especially since 30-year interest rates are still hovering in the 3.75% to 4.25% range. Click here for a most recent neighborhood sales. If you are thinking about selling your house, don't wait until spring, call me (Anthony Rael) today for a complimentary market analysis. Wishing you and your family the best in 2012. It's almost that time of year...start preparing to make the neighborhood sparkle this holiday season. More information will be posted soon! Thanks again to Harvest Lane neighbor Sue Norman for planting flowers and a few small perennials at the bottom of the hill (75th & Taft). Remember, volunteers are still needed to help keep the plants watered throughout the summer, so if you are willing to sign up for the summer watering schedule, please contact Anthony Rael at (303) 520-3179. Thank you! >> 4th of July Parade - Photos! We will be posting photos of the 2011 parade soon. If you have any pictures you'd like to share, please e-mail them to me. >> 4th of July Parade - Thank you! Thanks to everyone who attended the 2011 parade. It sure was hot & muggy, but everyone seemed to enjoy themselves. I would like to thank Dan Rose & Emma for dropping off a bottle of wine...that was very generous and completely unnecessary. I don't know how to reach them directly, so if you know them - please say thank you to them from Lori & I. We hope everyone had a great time the past few years and we look forward to seeing you again on July 4th, 2011. Be sure to decorate the kid's bikes, trikes, scooters, strollers & dogs and plan to meet at 12057 West 75th Lane by 9:00 a.m. After everyone is done traveling the Harvest Lane Parade Route, we invite you to stick around for coffee, doughnuts, popsicles, bottled water while visiting with the Arvada Fire Dept and your neighbors! Any questions - please call me at (303) 520-3179. >> I'm On The Move! Effective July 1, 2011, I am moving to RE/MAX Alliance at 5440 Ward Rd in Arvada. If you need real estate advice or counseling for yourself, your family or co-workers, please call me at (303) 520-3179. Thank you to The Norman Family for planting flowers and mulch in the planter box at the bottom of the hill (75th & Taft). Volunteers are needed to help keep the plants watered throughout the summer. Please contact Anthony Rael at (303) 520-3179 to get on the schedule. Thank you! As you may have already noticed, some of your fellow neighbors have cleaned up the lettering on the wall at the bottom of the hill and flowers were recently planted. Volunteers will be watering the plants all summer. Thanks to everyone for helping beautify the community! Start cleaning out your garages, sheds, closets & basements! Our Annual Community Garage Sale will be held on Friday & Saturday April 29th & 30th (7am-3pm). 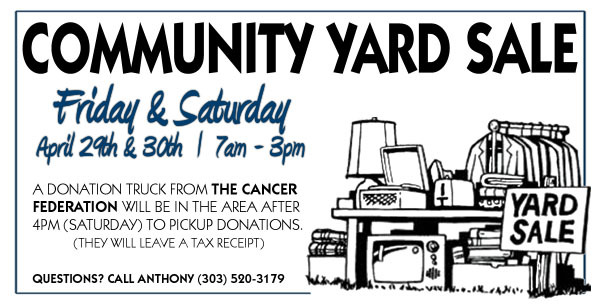 I contacted "The Cancer Federation" to let them know that the sale will end on Saturday at 3pm, so feel free to leave all of your unsold items at the end of the driveway after the sale for donation pickup (they’ll leave a tax receipt). Please clearly mark your items as "DONATION" so their drivers know what to take. In the past few weeks, I have received several verbal & e-mail complaints from residents regarding boats & recreation vehicles parked along our streets. According to the City of Arvada, "Recreational vehicles are not allowed to be stored on a public street for more than 72 hours." Recreational vehicles are defined as "boats, boat trailers, travel trailers, motorized dwellings, tent-trailers and hauling trailers." There is nothing I can do about it - you need to contact the City of Arvada at (720) 898-7000 or file a complaint online and they will issue a warning and/or citation for non-compliance. Start cleaning out your garages, sheds, closets & basements! The Harvest Lane Community Garage Sale will be held on Friday & Saturday April 29th & 30th (7am-3pm). I’ll promote the sale online and will also hang a large banner on 75th & Simms & directional signs on 75th & Taft St to bring traffic into the neighborhood. I will provide FREE hot dogs, chips, cookies and beverages to all of my fellow Harvest Lane neighbors. The brick wall at the bottom of the hill at 75th & Taft is showing signs of wear & tear. A few bricks are chipped and the gold “Ridge at Harvest Lane” lettering is peeling away. One of our neighbors and her 91-year old father-in-law have been planting flowers the past few years, but may not be able to continue due to heath reasons. We appreciate their efforts in the past, but now the rest of us have to step up. In the absence of a Home Owner’s Association (HOA), it’s up to each of us to maintain the wall and common areas to help maintain the beauty of OUR community. In addition to repairing a few bricks and planting flowers, a few neighbors have suggested that we add a few solar-powered lights in the planter box. Would anyone be interested in volunteering for a weekend "community improvement project" OR would you rather donate a few bucks and just hire a contractor? Once the flowers are planted, we’ll need volunteers to take turns watering throughout the summer. Please help! Finally, would anyone be interested in adding a matching brick planter box to the existing brick wall at the main entrance to Harvest Lane at 75th & Simms? We’ll probably have to contract out with a mason for this work, so a voluntary collection may be necessary. If there’s enough interest in pursuing this enhancement, I’d be happy to work with the homeowner & City of Arvada for approval. Remember, we have a *private* Harvest Lane Facebook “Group” page, so please voice your support or opposition to the proposed enhancements or just call me at (303) 520-3179 or e-mail your thoughts. Thanks! >> Simms Street "Quiet Zone" - FINALLY! As reported in the February/March Arvada Report, the long-anticipated "Quiet Zone" at the railroad crossing located near 76th Ave & Simms St is finally underway! In case you are not aware, a Quiet Zone is constructed in such a way that train horns are not routinely sounded at grade crossing, thereby impacting the quality of life for those near the tracks while maintaining safety. >> Simms Street "Quiet Zone"
Everyone along the road (76th Ave) have a leasehold interest in the entire road. So, even though everyone has agreed to a realignment at Simms, the City of Arvada still needs everyone's signature, including the mortgage holders. As of January 11th, the city has all but one signed & recorded. The contractor is standing by so that once they receive the signatures, work can begin. Having said that, permission from the Union Pacific Rail Road to work on their right-of-way has expired, so the city needs to get that also. This is not the same thing as the design of the crossing - that was approved by the Federal Railroad Administration (FRA) and the city doesn't have to start over with that. Let's hope dirt and asphalt starts moving soon! I spoke with a City of Arvada employee and was told they are locating the underground utilities so the fiber optic lines in the neighborhood can be upgraded. They will not be digging up the streets, but rather using some type of drill that feeds the lines. Work to be completed "in a few weeks". It's been a few months since we heard from Councilman Dyer this regarding the current status on our "Quiet Zone". I hope to post an update soon. >> How's the Local Real Estate Market?" Interested in knowing what the real estate market is like in Arvada or Harvest Lane? Feel free to call me at (303) 520-3179 for a brief conversation, get some stats and hear my thoughts on where we've been and where we're going. In addition to my expert knowledge, I have an abundance of tools at my disposal and can check comparables sales throughout the Denver area, give you a quick price opinion on your property and can even help you determine what the value of a particular renovation or upgrade in your home is worth. >> Annual Harvest Lane "Parade of Lights"
Click on the Lowe's link below or call Anthony and I will send you a coupon for 10% Off your next purchase @ Lowe's or Home Depot. In late 2015 or early 2016, Arvadans will be able to ride the RTD "GoldLine" from Arvada/Wheat Ridge to Denver Union Station in downtown Denver and also to DIA. Visit page 4 of the Oct-Nov "Arvada Report" for details. It's been several years (2005-2006) since we updated the community phone directory. I have the original MSWord document (thanks Heather), so if you are fairly new to the neighborhood and would like to be added or if you'd like to sign-up for "community news alerts" via e-mail, please contact Anthony Rael at (303) 520-3179. "The Federal Railroad Administration (FRA) has approved the revised design for the crossing. The owners of the blue home facing Simms are donating a small piece of land to the city and we have finally received the signed agreement from their mortgage company. Now we're getting easement agreements signed by all the parties along the road on the south side of the tracks. Apparently, they all hold overlapping easements for the entire road, not just the piece next to their property. We thought they had all agreed to sign the paperwork, but now a couple of them seem to be backing away. We think we will get this wrapped up in a couple of weeks. The plan is to begin construction in September." >> Harvest Lane & Ridge at Harvest Lane on FaceBook! I have created a new private Facebook "group" where access to information will be limited to residents of Harvest Lane & The Ridge at Harvest Lane. This is a good place to exchange ideas and get to know some of your neighbors a little better from the comfort of your home. Help spread the word and sign up today! For the past five weeks, many residents have been calling the APD regarding a suspicious person walking around the neighborhood talking on a cell phone. The individual may have a brain injury and/or mental health issues. The police department has been identified him and have determined that he is not a threat to anyone in the community. Please feel free to contact Officer Michael Hytrek #0603 with any questions or concerns regarding this matter. >> 2010 Harvest Lane Parade Photos! If you have a few pictures you'd like to add to our website, please submit them to Anthony at 303-520-3179. I will be checking in with councilman Dyer this weekend to get a status update on our "Quiet Zone". I'll post an update soon. >> Arvada City Council adopts a packet of ordinances to address the issue of building permits. This important issue has been a hot-plate issue for city council for a year. Read a synopsis of changes that were adopted. Congratulations to the Leiker's & Milne's for being voted "Best Decorated" Homes in Harvest Lane. See photos here. Please welcome the our new neighbors to Harvest Lane. Visit the Recent Homes Sales page. >> Announcing The First Annual "Harvest Lane Parade of Lights"
This is your chance to do your best "Griswold" holiday lights impression & win a gift card for "best decorated" home. Details available here. Our doorbell rang last night & much to our surprise, a few neighborhood children (you know who you are) handed my wife a zip-lock bag of money that they collected during a lemonade stand earlier in the day. They said the funds were raised to help pay for the neighborhood parade that they enjoyed so much! Needless-to-say, we didn't want to accept it, but the parents insisted. It's so wonderful to see such kindness demonstrated by these young children. We're glad you enjoyed yourselves! >> 2009 Harvest Lane Parade Photos Posted today! I'm sad to report that someone walked off with two of my "4th of July" signs late Friday night or early Saturday morning (3rd or 4th). They were along 75th Ave and not very easy to pull out of the ground. This is not the first time my signs have been taken - it's unfortunate & I hope this doesn't continue to happen in our neighborhood. >> REMINDER: Arvada Police reminds citizens to keep your garage doors closed & watch for suspicious people. The Arvada Police Department will be sending over some flyers which I will post here on "Decreasing Car Break-Ins" and other home/community safety. Stay tuned. 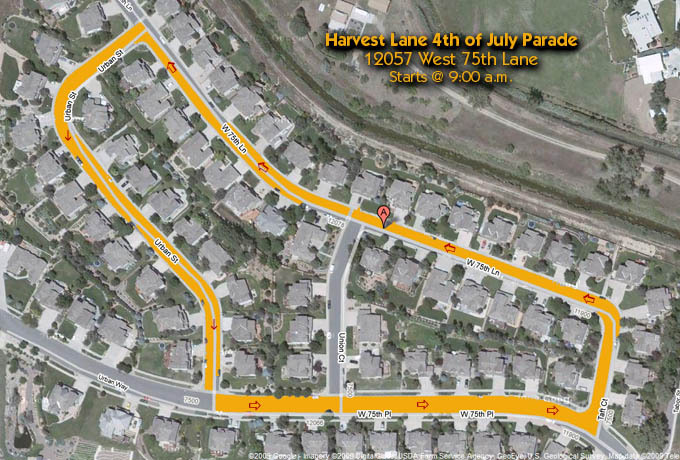 >> First Annual "Harvest Lane Parade of Lights"
I will be coordinating the First Annual "Harvest Lane Parade of Lights!" During the holidays, you'll have a chance to do your best "Griswold" holiday lights impression or just sit back and vote ONLINE. I'll give the winner a gift certificate (to be determined). More info coming soon. Here's the article from the Denver Post on Saturday, June 23, 2009 - "CO Homes haunted by past due to code violations" - http://tinyurl.com/mu653o - Councilman Dyer will be giving an update from the City at our upcoming sales meeting on June 30th. This is a very serious issue - stay tuned! If you'd like to find out what's happening in the neighborhood or the Arvada area that may impact you, your family or your property values, signup for the "Harvest Lane Community e-List". I will maintain the list and promise it will NOT be used commercial purposes or sold to any third-party for any reason. You have my personal assurance. Regarding the railroad crossing “Quiet Zone” on 76th & Simms St, please refer to the April/May 2009 edition of the “Arvada Report” - which most of you should have received in the mail yesterday. According to the article on page 13, not much has changed since the update I sent you on November 2008 (see message below). Below is a quick update on the status of the “Quiet Zone” that the City of Arvada is working to install at the 76th & Simms R/R crossing. As many of you may recall from the neighborhood meeting this summer, the City hit a roadblock with the installation of the “quite zone” due to an issue with vehicles not being able to turn left from the church and properties on the West side of Simms St. Since several months have now passed, I went ahead and requested an update from Councilman Dyer and his response is below. The last I heard the redesign has been completed and submitted to the Feds for approval which has not been received yet. I hope that will happen soon (within a month or so) so we can see if the contractor is willing to come back based on the original contract. I don't know if winter will be a problem, but once we finish the work we need to wait for the FRA to go through a public comment period (30-60 days) before we can notify the railroad to activate the quiet zone. Even then, based on our experience with the other zones, the engineers need to "get the word" to stop the horns. If one of your kids is ready to "leave the nest" and purchase their first place & they hire me as their Realtor, I will chip in up to $1,000 cash back at closing to help them decorate their new place. They MUST mention promo code "L2EHLPADL-JUN14" when first calling me to discuss the purchase. The property MUST be their first home or condo & the mortgage loan MUST be in their name. This offer can not be combined with any other discounts or promotions.